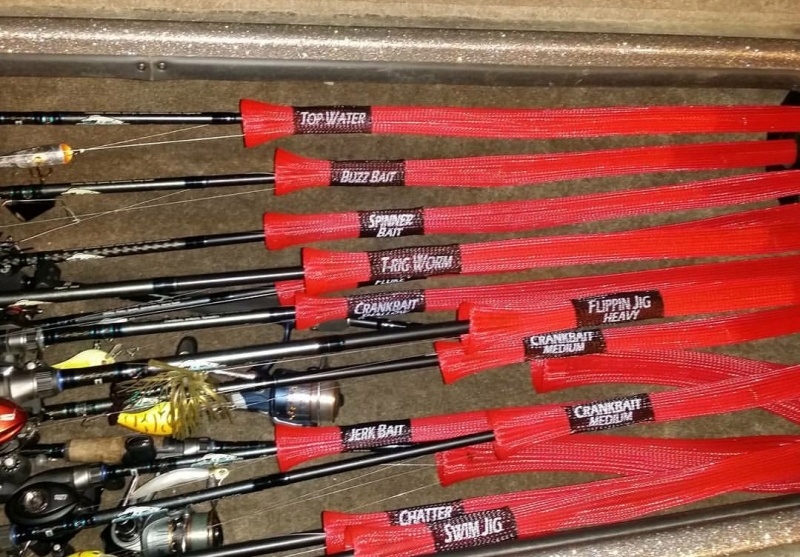 Recently there was a post by a young angler that wanted to organize his rods better. 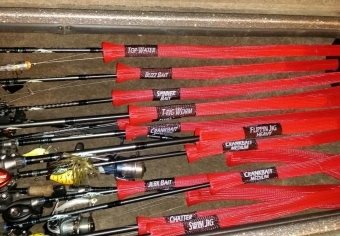 He purchased the Rod Gloves and then with duct tape and a marker, he labelled his rods so that he could retrieve them quickly in a tournament situation. We recommend saving your marker and duct tape by purchasing this inexpensive printed mesh tag for easy identification of techniques on each rod. The Rod Glove Technique Tags are a convenient and fast way to organize your rods in your rod locker. Whether you are in a tournament or organizing your rods at home, the Rod Glove Technique Tags are a great accessory to add to your Rod Gloves. Small and easy to install with over 32 various types of fishing techniques, we are sure that you will find your personalized tag. Many anglers prefer to match their Rod Gloves to their boat and like to stay organized. We understand that a full rod locker of 20 -30 rods with matching Rod Gloves can be pretty confusing. Purchase some of these tags and place them close to the bell collar so that when you open the rod locker you can quickly pull out the rod you need. To keep those Rod Gloves on your rods while travelling at fast speeds across the water, check out an inexpensive convenient accessory known as the Rod Glove Saver. It' such an inconvenience having them blow off so by easily attaching the Rod Glove Saver with the quick clip it is available in 4", 8" or 12" extendable strap to attach your Rod Gloves to your reel. Both of these accessories are an inexpensive way to assist with organization and to help you out while on the water or travelling. Why not grab some Technique Tags or some Rod Glove Savers to save yourself some time.